New Student Enrollment and Current Student Re-Enrollment Online! Our new Online Enrollment portal no longer requires the completion of paper emergency cards and enrollment packets! With our new online enrollment portal, you will have access to up-to-date information on your child and much more. In times past, we requested that parents complete packets with pen and paper for each child enrolled within PUSD. Our new Online Enrollment portal no longer requires the completion of paper emergency cards and enrollment packets! Our goal is to significantly enhance our direct-to-parent communications. A parent or guardian for each student must complete the online re-enrollment links for the upcoming 2018-19 academic year. As soon as you complete the required fields, your information will be permanently stored into our Student Information System. As well, your communication preferences will be recorded for all future correspondence. 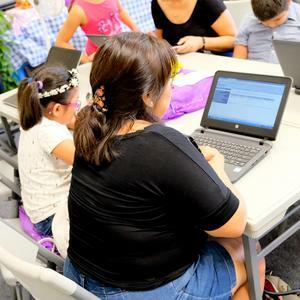 After you re-enroll your child on ParentConnect, you will have the ability to receive the latest correspondence from your child’s school site principal and from Superintendent Richard Martinez. at www.gmail.com and click on 'Create' account. In this first year, some families may receive multiple PIN accounts for all your students. Please contact your school to consolidate the accounts under one PIN. If you do not have access to a computer with Internet access at home, please visit your child’s school or our District Parent Center at 800 South Garey Avenue to use our computer labs throughout the summer (please check with you child’s school site for summer office hours). You can NOT complete enrollment on your cellphone. You can access the webpage from ANY computer (desktop, laptop, or tablet), it does not need to be a District or school computer. Where can I get my PIN#? Please go to your child's school and they will provide you with a ParentConnect Access Letter. Make sure you verify any check boxes at the bottom of every section to confirm, recognize, or accept the information you've typed, and then click submit. Check your email address at the final step AND when updating parent information, this is where the email confirmation for enrollment will be sent AND the information that will be saved in the school system for contacting parents. What if my child is not returning to PUSD for 18/19? Please notify your child's school, they will be able to provide you with exit forms and information for your child's future school.